Want to speed up the process of mastering your guitar technique and make everything you play on guitar feel easier than ever? To reach this goal, guitarists typically practice dozens of finger independence and strength building exercises, endlessly searching for the one special drill to transform their technique. The bad news is that the vast majority of finger exercises you practice will NOT make your finger independence improve. This has nothing to do with the exercises themselves (or with you), but has everything to do with how you practice these exercises. Until you apply the best practice approaches for training finger independence, you will always struggle with this area of your technique and your guitar playing will feel harder than it needs to. The good news is that the process for developing finger independence is very simple to understand and implement. In fact, you can attain this skill in only 5-10 minutes of practice time per day. Best of all, once you have learned it, you will begin to master every exercise you practice much faster than ever before. 2 big reasons why most guitarists struggle with finger independence and how to ensure they do not affect you when you practice guitar (hint: the size/shape of your fingers has nothing to do with it!). 4 elements of fretting hand technique you must focus on to make your finger independence improve with any exercise you practice (#3 will save you thousands of hours in wasted time and frustration). How to use a basic strength training principle to improve finger independence and make your guitar playing feel easier than ever. 3 training phases you must go through to develop perfect finger independence for guitar, and how to practice during each one for fastest results possible in your guitar playing. How to turn your guitar practice warm up time from a boring waste into an effective mini guitar practice session and master your fretting hand technique once and for all. 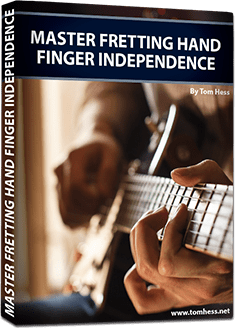 Get INSTANT FREE access to the guide to mastering fretting hand finger independence for guitar now. Simply enter your name and email, then click the 'Give Me Access Now' button to enter. All information is kept 100% private and confidential.